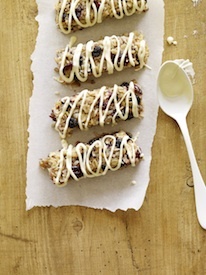 Enter our Power Hungry cookbook giveaway and you’ll be on your way to homemade energy bars in a jiffy. Eight readers will win a copy of this new book! Energy bars and protein bars are awesome for helping fuel your workouts or sub for a meal (in a pinch). If you’d like to learn to make your own, get in on our Power Hungry Cookbook giveaway today! I don’t know about you, but when I look at how much money I spend on energy/protein/meal replacement bars I just cringe. Yes they are tasty, but dang are they expensive! That’s why I was so jazzed to read about this new book, Power Hungry. I called for a review copy so I could check it out because I thought our AFH readers would appreciate knowing how to make tasty energy bars at home, too! I tried out a few recipes and now I’m so glad I investigated this book—it’s awesome! 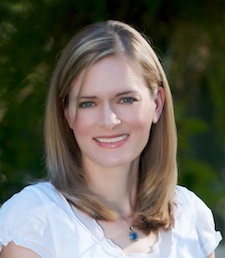 Written in a friendly style, author Camilla Saulsbury’s (pictured at right) new Power Hungry book provides easy-to-follow recipes for many varieties of 100% soy free energy bars, protein bars, granola bars, breakfast cookies and even endurance gels. Paleo options and raw bars are also included, along with adaptations for vegan and gluten-free bars. These recipes are packed with good stuff like oats, flax, protein powder, quinoa, buckwheat, chia seeds, sesame seeds, nuts, dried fruit, citrus zest, even kale and yes, the occasional chocolate chip. Sweeteners used in the bars vary from honey, agave and molasses to homemade glucose syrup and regular old sugar. I think the sweetener choice could be adapted to your liking in most of these recipes. Nutrition info is listed for each recipe, too, so you’ll know how many calories and how much protein (two of my primary concerns) are in the bars. There are LOTS of pictures, too, which is nice. I tried the Greek Yogurt Muesli Bars (see the pic at left, from the book) and I doubled the recipe, thinking that my family would need way more than an 8X8 pan’s worth of them. (I really get bummed out when I make a pan of something and the recipe then says to cut it into 48 pieces? Seriously? Their 48 pieces are my 24—two bites does not a portion make, at least in my house! So, I made a double batch.) Well, we finished them, but it took over a week because these babies are dense and filling and even though the portion size seemed small, it was actually perfect! Now I’ll trust that the author’s portion size sense matches mine from here on out. Anyway….the bars were delicious; I especially liked the addition of lemon zest in the recipe, which gave it a freshness and wonderful extra and unexpected flavor. I also made the Quinoa Protein Bars in the “Winter Spice” variation–very tasty. All in all, I LOVE this book and am happy to give it a great big thumbs up. If you like bars of any sort, you’ll find at least a few favorites among these many recipes. You can order a copy on Amazon, or try and win one of 8 copies that we are giving away! 1. Sign up for the AFH e-newsletter and “Like” AFH on Facebook. 2. Leave a comment below this post (not on Facebook), about why you want to win a copy of Power Hungry. Keep in mind that sharing this contest or any AFH content on your social media is encouraged! Entries will be accepted until Thursday, November 14 at midnight EST. I love protein bars but don’t like all those unnecessary ingredients. I want clean and natural and making them myself is the best way to do that. I’d love to get this for more ideas!! 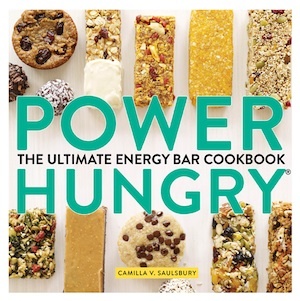 I would like to win this cookbook so i can make my own energy bars. Would love this. Always on the look out to try out new healthy things and if I can make them in my own home without all the junk that goes in the stuff at the store I am all for it. It would be super awesome i be able to make my own protein bars! I want to win a copy of this book because just yesterday I was throwung my hands up in frustration with my afternoon sugar cravings! I’m doing great on eating healthy breakfasts and lunches but I need to find a better choice for my afternoon snack attack, something I can prepack for the week like I do with my other meals and keep on hand to discourage myself from stopping at the gas station for candy bars on my way home from work. These look like delicious choices to keep me from derailing my healthy lifestyle! I would like to make my own energy bar so i know what is in my energy bar. I love making different foods from scratch as it gives you the ability to know exactly what’s in it! It would be so nice and I’m sure cost effective to eat my own bars! I love having protein bars to grab as quick meals after my work out. The recipes in this book look delicious, and I would love to be able to make them at home instead of buying them! Want to make healthy snacks. My protein bars are so boring and I should take time to make some I look forward to eating. I hope I win a copy of this great cookbook! Thanks! My husband has asked me to find out how to make protien bars. I think i just found out! If i don’t win it, i will buy it! I saw this book being offered on Leite’s Culinaria website as well. I’m always looking for creative ways to make snacks that taste great and are good for you. This would be great to have. I love protein bars but quit eating them due to the (usually) high sugar content and processed design. This book looks fantastic and I’d love to be creating some of these recipes for my friends and family. Would love to win!! I would like to win a copy because I would like to try making my own bars so they are healthier and less expensive. This book looks awesome! I am always looking up new bar ideas online! I like the fact that there are a variety of different recipes for different lifestyles. I think it would be more cost-effective and healthier than buying a lot of the store bought brands. I love energy bars but so hard to find ones low in sugar and gluten free. It would be great to make my own! I’ve tried before but many of the recipes I found didn’t turn out so great. Having something healthy and homemade would make a much better snack! i have tried making energy bars, and they turn out not good. i would love to try recipies that actually work. I have a child that needs easy, healthy protein sources. Bars do that, but they’re expensive and have things in them that I’d rather not use. Winning this book would be great! My husband and I are on a diet (who isn’t?) and it’s difficult to find foods we can eat that are small in size yet big on healthy ingredients. We also like snacks and get tired of the same old things. This book would help us fix items that allow us to enjoy sweet/crunchy/chewy treats that could also double as meals. Thanks!! I want to win this because my family and I are very much on the go. We have to pack quick meals to eat in between events. We are always looking for a healthy option that will also taste good. And these would fit that part well. I want to win this because it would provide me with more options and healthy foods that would be ideal for our family. Since my recovery this is so important. I want to win them to give them to my daughter. She is always at school going from this event to that event and a lot of times she misses a meal. This way she can eat something healthy and not have to stop. I like a healthy snack at school every day to keep my energy up! I like to have a healthy snack when I am traveling for work and energy bars are perfect! The onlt problem is with store bought ones I don’t recognize a lot of the ingredients or they have too much sugar. If I am making them on my own I could avoid that problem. I would love to make homemade energy bars for my husband and myself. So much better than the stuff in stores. I bake a great deal. One of the only baked goods I have yet to try to bake are energy bars. I would love to have recipes to do so. I would love to win one of these books so I can keep my boys from always being hungry! I really do feed them but they are always needing a snack. And with 4 boys ages 8-13 they eat a lot. These would be great for on the go also or for a quick morning pick me up. I know I could also put these in my husband’s lunchbox for when he’s out hunting in the woods all day. I’d love to make them myself and know what ingredients are going in them. This looks like a great book! Thanks for the giveaway! Well, first of all I love health food cookbooks, but mostly I would like to win this because when you have an active 11 year old who plays soccer, basketball, and does many other things, bars always end up being a convenient snack. However, I am one to not go into processed foods and love making everything myself, so this book would be incredible to help me with learning how to make good cereal bars, as this is the one snack/treat I still haven’t mastered to make at home. There are so few gluten free eating options in my area. (There aren’t even many gluten free bars available!) I usually wind up taking something to eat whenever I leave my house. It would be great to create my own selection of gluten free bars! I eat energy bars daily and would love to start making my own to save money. I completely agree that store bought are tasty yet quite costly when you several at a time. I usually plurge on myself and use as a reward and buy at minimal 2 bars a week. I would love to win the recipe book just to save money and make them healthier yet still tasty for the whole family. I would love to know how to make nutritious energy bars. I’m trying to be more healthy and having more options for when I want to snack ) what be so delish! Yay! Thanks so much! Replied to the email with my info. Thank you so much! I already sent my info in. I tried to reply to your email, but just found out that Yahoo erroneously put it in my drafts folder instead of sending it. I re-sent it today. I sure hope that you will accept it. If not, Thank you anyway. I do enjoy your site.